The start of summer has finally arrived and with it came all these free crochet patterns. Some of your favorites ranged from free crochet afghan patterns to free crochet hat patterns to summer tops. If you missed out on some of these patterns or you just want to relive them then check out this fabulous collection. If you're not subscribed to receive the newsletter Hooked on Crochet, then do so now so you don't miss out on any more amazing patterns. Framed Church Window 6 inch Square- This is an amazing free crochet pattern that will really remind you of a cathedral church with stained glass windows. Can you picture it? This was one of your favorites from the month of June. Monet Afghan- Do you like the artwork of Monet? If so, you'll also love this Monet afghan as it looks like a piece of art. As the designer Drew Emborsky says, "the colors look like an impressionist painting". Fast & Easy Summer Crocheted Hat with Brim- Crochet yourself a seasonal brimmed hat with this designer. It's light enough to wear during the spring and summer months, but it's sure to do the job and keep the sun off your face. Bella Camisole- This is a great top you can wear over your bathing suit when headed to the beach or pool. The floral detail gives it a feminine look and feel. Black Openwork Summer Top- For a professionally-made appeal, try out this Black Openwork Summer Top. The intricate crochet stitching is worth the effort when you see this beautiful sweater. Pair it with a collared shirt for work or a short-sleeve t-shirt in the summer. Beach Cover Up- Flaunt your stuff while wearing this beautiful beach cover up. A chart is included to help you follow these step by step instructions. A July 4th Crochet Afghan- Make a fabulous afghan for the fourth every year. Lay it out for all to see and admire. It's never too early to start crocheting something for next year. Crochet Flower Pattern: Rose- This is an intermediate crochet pattern that you will adore making. The curled up rose is just beautiful. It adds elegance to any project. 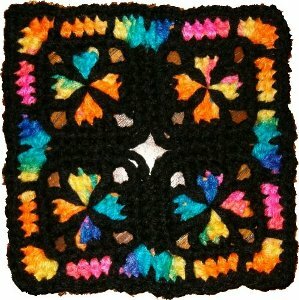 Grannie's Star- Make this Grannie's Star free crochet pattern into anything you want. You can use it as a dishcloth, a coaster or a simple decorating piece. The red, white and blue yarn is perfect for the Fourth of July. Hobo Style Bag- This bag is great for shopping or carrying your books around. Use this free crochet pattern to make as many hobo bags as you want. Make them in every color.